Contra dancing is a traditional form of American folk dance that evolved from the longways country dances popular in English society centuries ago. We’ve come a long way since then! Contra dance communities are thriving across the United States, providing dancers of all ages and experience levels with the opportunity to smile, move, connect, flirt and create an evening of dance nirvana with each other. Contra vs. Square: Most contra dance evenings will include a square or two. 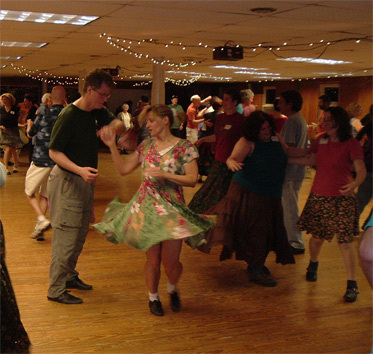 When describing contra dance to the uninitiated, it is tempting to invoke contra’s similarities to square dancing, but the differences are what stand out. Despite the common moves such as do si do, allemande, and swing your partner, contra dancers change partners frequently and through the group synergy will end up dancing with everyone in the room. And no special dress is required! We encourage dancers to switch partners after each dance, and experienced dancers enjoy dancing with newcomers in order to share their love of contra. You don’t need to bring a partner with you to a contra dance – just smile and ask someone to dance!